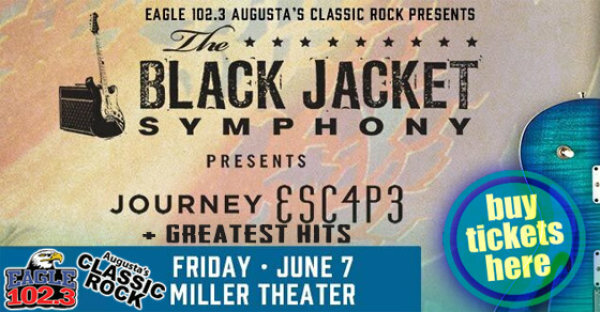 Eagle 106.3 Augusta's Classic Rock, Emporium Presents and the Miller Theater are proud to present a back-by-popular demand performance by Black Jacket Symphony June 7 at the Miller. Tickets on sale now. The Black Jacket Symphony will present Journey’s iconic album ESC4P3 live – note-for-note and sound-for-sound – as well as a full set of greatest hits. Tickets will be available at the Miller Theater Box Office (10 Am-6 PM M-F), MillerTheaterAugusta.com or by calling 706.842.4080. The Black Jacket Symphony offers a unique concert experience by recreating classic albums in a live performance setting with a first-class lighting and video production. A selected album is performed in its entirety by a group of hand-picked musicians specifically selected for each album. With no sonic detail being overlooked, the musicians do whatever it takes to musically reproduce the album. Following the album and a brief intermission, the Black Jacket Symphony returns to the stage to perform a collection of greatest hits by the evening's artist. The Miller Theater is a historic Art Moderne movie palace, built in 1940, closed in 1985 and reopened on January 6, 2018 after a seven year, $23 million restoration. The SMG-managed facility is the home to the Augusta Symphony and presents a broad and diverse line-up of music, comedy, theatrical and dance performances.